'A Piece of Eight (I)', 2011, digital colour photographs. German philosopher Thomas Metzinger describes how the conception of the self is misconstrued. He proposes that our conscious existence is not, as we would like to believe, an individual narrative or independent thing, but actually a system of objective constructs, expressed as subjective phenomenal experience that results in what might be termed ‘cultural evolution’. And so, with this definition, the self-portrait once defined by the subjective, emerges instead as a detached body of cultural signifiers. With Metzinger’s comment in mind, Hayley Tompkins’ latest exhibition A Piece of Eight appears not as a composite of subjectivities, but rather a universal self-portrait that both misses and inserts the viewer (or at least the input of your misinformed construct of self). A psychedelic and literal mapping of the traveller’s journey (the ‘betwixt’ condition of the viewer), Tompkins’ exhibition is a suspension of reality through the repetition and display of banal experience. The gallery is recast as a hallucinatory office experience, and the exhibition a collective subconscious ramble. The ‘piece of eight’ in question is a silver coin. Evoking notions of piracy and the lawless adventurer, this token is a symbol of Tompkins’ continued examination of cultural exchange and capital value of the material object. Here, the relationship between value and the viewer’s interaction with reality plays out; the artist is presented as a raider of weightless accoutrements, the identities of which disintegrate through appropriative repetition and dislocation from use. The exhibition is constructed as a sparsely populated waiting room of vivid hypnagogic contemplation: a plethora of collected and altered objects—photography, watercolour painting and adapted sculptures—make up Tompkins’ lexicon. This is a rhetorical space that questions the rules of modern-day aesthetics and the collection of the extraneous details of visual retention. A neat, regimented line of works, ‘Piece of Eight (I)’, ‘(II)’ and ‘(III)’, all 2011, surrounds the room like an extended, gif-laden emoticon, recalling the punctuated and rhythmic language akin to online instant messaging services. Photographs of Macbook keyboards and geometric fabric are copied and placed around the gallery like stills from a film. These are civilised and unavoidable pieces of cultural detritus— the background imagery of the modern worker caught within the concrete poetics of societal repetition. 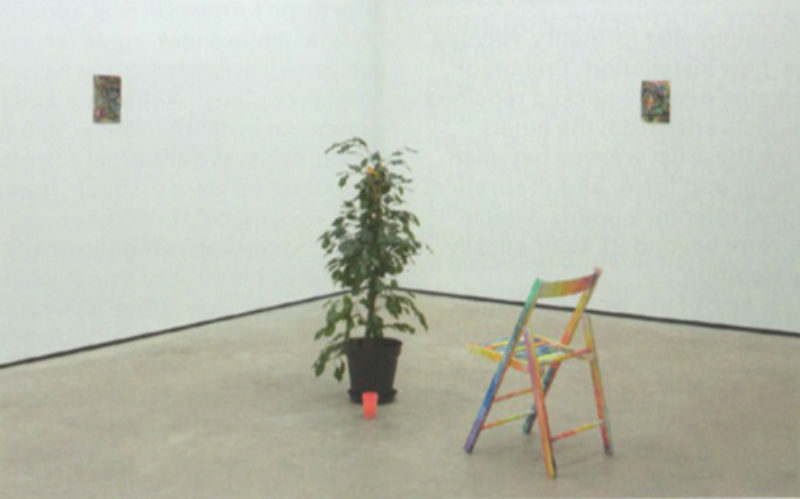 Modern objects are shown as declining into ruin; they are archaic remnants, tiny totemic idols of the recent past, evidenced in works like ‘Charger’, 2011, whose branch-like additions of discarded mobile phone batteries echo the natural structure of the potted plants, and which populate an untitled object arrangement in the central channel of the gallery. This strangely utopic working ambience is continued in ‘Armshell’, 2011, whose hypnotic triptych of the same photographed watch face has stopped at the widely acknowledged ‘break time’ of a quarter to eleven, while a pastel blue mallet, painted knife and disembodied shirt sleeve provide a unified toolkit to further articulate and insist upon this indiscriminate material dreamscape. A series of untitled watercolours sit on the periphery of these set-ups, like badly compressed jpegs of technicolour motherboards, echoed in the tie-dyed striations of the slatted wooden seat of ‘Chair’, 2011. It has been said that Tompkins chooses objects that have little history, that remain somewhat timeless in order to appear absent in the overall composition of her work. Contrary to this, A Piece of Eight suggests Tomkins is less engaged with the intentionally functionless and aloof stance, and more interested in implied definitions. Casting objects as characters within a highly orchestrated setting (rather than as a backdrop to the physical process of relational painting), this exhibition expresses Tompkins’ connection to reality. This is a self-serving visual memory bank that recognises the seemingly insignificant material details of modern day living, the definition of which exists through shared experience and subconscious product placement.